The power sector has existed for over 100 years first in the major European countries and in the others later on. Throughout this time, it experienced waves of change in its structure and regulatory approach driven by technical and economic developments. Regulatory reform of the power sector involves a complex interplay of different factors. There is a dynamic relationship between restructuring, ownership and regulatory changes, changes in institution of competition. Economic activities need certain amount of energy and it is one of the most important factors in economic and social development and one of the most required inputs for the production. Therefore, countries aim to establish their energy systems to provide reliable energy for the economy. The aim of the study is to analyse the electricity market with the historical perspective in Finnish and Turkish cases both economic and ownership background of the power market. Finnish electricity market has a unique structure. The industry is diversified in the production technologies: nuclear, hydropower and all types of thermal units are exploited. The market has always been a multi-player business. Besides, Finnish electricity market is one of the most competitive markets in the world. In Turkey, in contrast, the legal and regulatory framework surrounding the electricity market and liberalization and radical reconstruction of the market has always been on the agenda. The Turkish electricity market was operated by state-owned companies. It has been deregulated under the guidance of International Monetary Fund (IMF) and World Bank since 1984. As in many other countries, reforms on the electricity market in Turkey have been based on increasing the private participants in the market and strengthening competition. Turkey has typical developing country features such as having less efficient electricity system, small private sector participation, lack of political institutions, skilled and experienced human resources. The article studies the uniqueness of electricity market structure, the improvements and togetherness of state-owned and private companies in Finland and market structure, improvements and some failure in Turkey and compares them with historical perspectives. The article does not attempt to place Finland as a model for Turkey, but as a successful case, which was well established and organized. Finland is among those countries such as Norway, UK, and New Zealand that fully or almost liberalized their market by restructuring the electricity market while Turkey is in the list of countries that attempted to liberalize the market but still requirements are not fulfilled. Finnish electricity system and its technology policy are important for transforming the agrarian society into an industrial one. Electricity was the crucial sector for developing economic and social situation of Finland. Finnish electricity market is an interesting case for several reasons (Pineau and Hamalainen, 2000). Firstly, the structure of the market has been always unique compared with other markets and especially with other Nordic markets. Secondly, Finnish electricity industry is diversified in the production technologies: nuclear, hydropower and all types of thermal units are exploited. The presence of competition in the transmission network is an uncommon feature of the Finnish electricity market. Finally, the Finnish electricity market has always been a multi-player business and before deregulation, small utilities were present along with state-owned companies. In Turkey, in contrast, the legal and regulatory framework surrounding the electricity sector and liberalization and radical reconstruction of the sector has always been on the agenda. As the situation is in many European countries, the Turkish electricity market was operated by stateowned companies. It has been deregulated under the guidance of International Monetary Fund (IMF) and World Bank since 1984. As in many other countries, reforms on the electricity market in Turkey have been based on increasing the private participants in the market and strengthening competition. Turkey has typical developing country features such as having less efficient electricity system, small private sector participant, lack of political institutions, skilled and experienced human resources. As Kaijser and Hedin (1995) mentioned, electricity systems have been prominent not only in the Finnish economy but also in producing other types of energy supplies in the 20th century due to rich hydropower resources. This is what renders Nordic countries interesting to study. On the other hand, Finnish electricity market has some certain unique features which distinct it from electricity markets of other industrialized countries. Before the deregulation, the Finnish market was already open and multi-player, this was not the case in many other countries and as well as in the Turkish market. In Table 1 Nordic, three European countries and Turkey are listed with the GDP changes over years. By the beginning of the century Finland was behind of Denmark and Sweden in Scandinavia. Electricity technologies had to be imported and wood was the main energy source in Finland. Turkish economy also carried the same characteristics at the beginning of the century. After the collapse of the Ottoman Empire during the First World War, it was the birth of Turkish Republic, the Turkish economy was underdeveloped and agriculture depended economy. The main energy sources were limited and the mineral sources were under the control of foreign privileged firms. Level and transfer of technology was quite low and electricity and electric equipment were brought to the country about 30 years later than the European countries. This study starts with an historical overview based on analysis of progressive development, investigating Finland and Turkey’s differences and similarities such as natural resources, technology policy and transfer, and industrial development of the electricity market of each country. Production and consumption of energy is not only crucial for developed countries but also has so important effect on the economy for developing countries. As a developing country, rapid changes in the structure of the Turkish economy from the agricultural to the industrial have resulted in rapid increase in electrical energy requirements. The gradual change in the structure of Turkish economy away from agriculture towards increased industrialization accompanied by an increase in total energy requirements. Having huge differences between the 19th century and the current situation in the Finnish economy and the electricity market let me to attempt to ask the question of how the Finnish electricity market has developed from the beginning of the industrialization of country until the deregulation of the electricity market and its impact on the economy. At the beginning of the century, Finland was far from being an industrialized country and the GNP per capita was below that of any other Nordic or Western European countries (Myllyntaus, 1991). Turkish economy also carried the same characteristics at the beginning of the century. So initial question is how Finland benefited from electricity in modernizing the economy and sustaining economic development, and managing to be among industrialized countries classification while Turkey is still considered a developing country. Finnish economic and electricity history can be divided into three periods: Autonomy (Grant Duchy Finland; between 1809 and 1917), Independent republic between 1920 and 1939, and the Post War period that is after 1944. Finland was autonomous by the end of the 19th century, it was less industrialized than other Nordic countries and compared to Western Europe, Finnish economy was based on agriculture. Technologies for electricity generation were mainly imported and the major source of energy was wood. Finland relied mainly on indigenous energy sources: firewood, waste and peat. Finland developed to become a modern electrified industry and found its way up to the same level as other earlier industrialized countries in the same vicinity of the world. In Finland, electrification started early, in December 10, 1877 acting physics professor Karl Selim Lemström imported the first dynamo to Finland for his scientific experiments at the University of Helsinki, and this was the first demonstration of electric light. The first dynamos were purchased in 1881 from Edison and were installed at the Finlayson factories in Tampere to produce the current to light the textile and spinning mills with the new glow lamps invented by Edison. The first electrical equipment was offered for sale by an official of the Telegraph Board, Daniel Johannes Waden (1850-1930). The electrification of urban areas proceeded with moderate speed from the mid-1880s to the early 1920s. Before 1881, Gottfr Strömberg in Varkaus constructed his own generator to feed an arc lamp. A number of rural and industrial electricity works were established at the end of the 1880’s. Progress was slower than in many other countries due to lack of economic and political stability in Finland before the World War I (Myllyntaus, 1990c; Myllyntaus, 1991; Nevanlinna and Lax, 1969). During the period of 1920-1939, Finland was emerged as a new country. On December 6, 1917 independence was declared and the Parliament of the new republic made three important decisions concerning electric power: to prohibit the exportation of electricity, to construct a big state-owned hydroelectric plant at the famous Imatra rapids on the river Vuoksi, and to built a stateowned trunk grid of nearly 500 kilometres from Imatra to the main cities Turku, Helsinki, and Viipuri. The motivation for all those measures was to use the country’s national resources only for national purposes and prevent foreign capital from intervening in the domestic energy economy. The final capacity of the Imatra power plant was estimated to be about 150 MW and that was well for local needs. Thus, the plant had to be supplemented with an extensive network of power transmission for distributing its output around southern Finland. In 1919 transmission lines extended for short distances in Finland and transmitted only a small amount of electricity. The expansion of transmission lines was carried out without any national plan in the early 1920s since no standard tensions were applied and many different voltages were used (Myllyntaus, 1990a). After the World War II, Finland prepared to abolish the strictly controlled and centralized power system in force in wartime and the government decided to hold the control. The government attempted to mitigate the acute electricity shortage by reducing consumption, utilizing the whole thermal capacity, and raising the total capacity for hydroelectric plant to the level demand for electricity. It launched an emergency five-year program (1946-1950) for constructing new hydroelectric generating capacity. For organizing the electricity supply industry for the long run, the government set up a committee in November 1944 which published a report considering on six alternatives for organizing the nationwide electricity supply system and four of these alternatives supported by different groups (Myllyntaus, 1990a): to nationalize all noteworthy power plants and transmission lines over 50 kilovolts, to merge private, municipal, and state-owned power plants and transmission lines into a mix “Giant Concern”, to form a new nationwide transmission company (Valtakohto Oy), which would oversee and operate all the transmission lines with a voltage of 100 kilovolts or over, to preserve the existing ownership structure and organize the interconnection voluntarily. From the 1940s, private and state-owned companies built several hydroelectric plants, some largest of them were built on the rivers Oulu, Ii, and Kemi in the Northern provinces. The national grids were extended from south to Lapland and the long-distance transmission systems were operated with a tension of 110 kV until September 1951. The distance of 500-800 kilometres was one of the longest transmission spans in Europe at the time. The length of high and medium tension lines trebled between 1945 and 1965. The average annual growth rate of mileage was 6.1 per cent. During this period, all industrial and population centres were connected to the national grid while operational security increased. In December 1957, Finnish Parliament abolished the law of 1919 prohibiting the export of electricity on a large scale to be able to exchange of power with Sweden by extending the grid northward without great expense due to the threatening shortage of electricity in the mid-1950s. In 1963, the largest companies of the five Nordic countries founded NORDEL, an organization to promote mutual technological and economic cooperation in electricity supply and power exchange was extended to cover four countries: Finland, Sweden, Norway, and Denmark (Myllyntaus, 1990b). Nuclear electricity came to Finland in May 1977, 21 years later than it was built in United Kingdom in 1956 (Ray, 1988). Finland has two nuclear power plants. One was owned and run by Imatran Voima Oy (IVO), the 95.6% state-owned company, International Energy Agency (IEA) until the restructuring in 1998 owned by Fortum Oyj, the 75% state owned Energy Company. The chronological development process of Imatra Hydro power and finally Fortum is as follow (Fortum, 2004). Construction of the Imatra hydro power plant was started in 1921 and in 1923. A decision has taken on constructing an electricity transmission line in Helsinki and Turku, which serves the Imatra power plant. The first unit of the Imatra Power Plant was started in 1928, opened its hydropower in 1929 and the hydro power plant became a limited company in 1932. In 1945 IVO started the construction of the 220-kV power transmission line between Pyhäkoski and Hikiä. In 1955, construction of Neste’s first refinery in southwest Finland began. In 1958, IVO and Statens Vattenfallsverket, the Swedish state-owned electricity company sign a contract on the construction of a 220-kV power transmission line from Finland to Sweden. In 1966 Neste’s second refinery, the Porvoo Refinery, came on-stream, in 1970 Neste became the largest company in Finland and had an important role in balancing Finland’s trade with the Soviet Union, IVO started the construction of a nuclear power plant in Loviisa. In 1985 The Rauhanlahti peat-fired Combined Heat and Power (CHP) plant constructed and owned by IVO. In 1986 IVO International Ltd established. In 1989 Finland’s first and the world’s northernmost grid-connected solar power plant started operations in IVO’s Kopparnäs energy park in Inkoo. In 1993 IVO Generation Services Ltd (IGS) established. In 1994 Borealis, the petrochemicals joint venture with Statoil, and Gasum, the natural gas company co-owned with Gazprom, established. In 1997 a decision of the Fortum Group to combine IVO and Neste was made in December. In 1998, in June, Neste became Fortum’s subsidiary, on 28 February, the holding company IVO-Neste Yhtymä Oy established and in 1999 the operations of Imatran Voima Oy transferred to the name of Fortum Power and Heat Oy. Fortum’s new organization becomes effective on 1 January 1999. Fortum is now a leading energy company in the Nordic area including the Baltic Rim and its main products are electricity, heat and steam, cold, traffic fuels, heating oil, and related services, to households, industry and society. The other power plant is Teollisuuden Voima Oy (TVO). TVO’s Olkiluoto plant is located on the south western coast near the town of Rauma. It comprises two boiling water reactors of Swedish design, in commercial operation since 1979 (Olkiluoto 1) and 1982 (Olkiluoto 2). The blocks were originally designed for commercial capacity of 660 MW each, but with minor technical changes, their individual capacity was raised to 710 MW in 1982/1983 and to 840 MW in 1998 (International Energy Agency, 1999). Finland’s nuclear power plants have achieved very high load factors; in 1997, these were above 94% for all four-reactor blocks. These are the highest load factors that have so far been achieved consistently in any nuclear power plant in the world. Simultaneously, the occupational doses of radioactivity that nuclear power plant staff is exposed to lie significantly below the European average (International Energy Agency, 1999). Table 2 shows the source of energy for electricity production in Finland. The biggest share is on the thermal power and also nuclear power has an important share. Unlike the other Scandinavian countries the share of nuclear power in generation is 2646 MW while it is 8938 MW in Sweden (Nordel, 2009). After the 1950s, electricity sector has been considered as natural monopoly and many countries consolidated and nationalized electricity supply industries into state-owned companies under the assumption that a state-owned enterprise does not maximize profit, so public ownership should lead to greater consumer welfare. But during 1990s the electricity supply industry went towards liberalization in many countries with the motive of efficiency in the sector (Steiner, 2000). The Finnish energy market was liberalized by several step-by-step reforms, already before the beginning of the 1990s. The aim has been to make more effective the functioning of the markets and thus to cut the cost of energy users. On 1 June 1995, a radical step towards free competition was taken with Electricity Market Law. Thereafter, Finnish energy markets are more open than the energy markets in almost any other countries in the world. Since the beginning of November 1995, electricity distributors and large consumers are entitled to buy electricity from any producer (Ministry of Trade and Industry, 1996). In Finnish electricity market, there have been private ownerships beside the state-owned companies. Another characteristic has been the relatively weak formal government enforces regulation. Instead, there has been self-enforced club-regulation and yardstick competition and also the role of publicly owned dominant firm has been extensive (Kopsakangas-Savolainen, 2001). Table 3 shows the companies and their share in electricity generation. One of the important features of Finnish electricity industry is that generation has always been multi-player business. Although former IVO (called Fortum now) had dominant position in the industry, other smaller utilities were already important before the deregulation and had a capacity of nearly 4000 MW, distribution companies and industries were also producing electricity (Pineau and Hämäläinen, 2000). The Finnish transmission and all its major interconnections are organized and owned to 99.5% by the national grid company Finnish Power Grid plc. It has a total of 13.750 kilometres of power transmission lines. Its responsibility is assurance of the technical functioning of the Finnish transmission system. It sells its services to all electricity market parties on equal terms. Fingrid is partly owned by the State of Finland (12%°), Fortum (25%), which is itself to a major extend owned by the State of Finland Pohjolan Voima (25%), is a private power company, and a group of national insurance companies (38%), namely Varma-Sampo, Ilmarinen, Tapiola Group, SampoGroup, Pohjola, Suomi and Henki Fennia. Before 1997 and the EU-directive came into force, Finland had partly opened its energy market to competition. The Legal statute is the “Electricity Market Act” from 17 March 1995, which took effect in June 1995. Before the liberalization there was free choice for consumer only for those who purchased more than 500kW. From the 1 November 1998, also small-scale users are free to utilize the effects of decreasing costs and better services from competition and choose among their suppliers. In Turkey, development plans in electricity sector particularly shaped by current government’s priorities and choices, as well as international conjecture. Therefore, it is beneficial to study Turkey by dividing it to appropriate periods. The first attempt to electric power was made with the installation of a plant in Tarsus in 1902. This is described the initial and real private enterprise which took place in southern part of the country and far from the capital. The first organized electricity production began with the Silahtaraga Thermal Power Plant in Turkey in 1913 under the Ottoman Electricity Firm, which was established jointly by Hungarian Ganz, Banque Generale de Credit and Banque de Brexellese Firms and first electricity provided to Istanbul on 11 February, 1914. Table 4 gives the historical changes in capacity, generation and consumption from the beginning of electric generation. During the period 1923-1930 new republic tried to liberalize the economy and it is called as liberalized period. When the republic was found in 1923, there were 38 power plants, which were all motor-driven, and owned by private individuals (14), joint firms (13) and municipalities (11) respectively. The annual total production of these plants was 44.5 GWh, 5% of total population was provided electricity and annual electricity consumption per capita was 3kWh at that time in the country. The new republic allowed foreign joint stock companies operations during the 1923-1930 period which was called liberal period. Through these foreign companies operations Ankara, the capital of Turkey, was provided electricity in 1925 by the German MAN and AEG firms. Mostly foreign firms such as German, Belgium, Italy and Hungary were active in electricity market until the first native private firm Kayseri power plant established in 1926. Turkey had 48 power plants by the end of the liberalized period and installed capacity reached 74.8 MW, electricity generation was 106.3 GWh and the annual consumption per capita was 6.2 kWh (Zenginobuz and Ogur, 2000). The years between 1930-1950 is called as nationalization period and as was effected all countries, the great depression effected Turkey after 1929 and with the effect of crisis, the state’s interest in and the emphasis placed on the supply of electric power increased with changing economic conditions. The initialized industrialization process necessitated a planned construction of power plants. The General Directorate of Electrical Work Study and Research Administration (EIEI), General Directorate of Mineral Research and Exploration (MTA) and Etibank established in 1935, state control started in economy and after 1935 some of the electric power plants granted as concessions to foreign joint-stock companies were nationalized and run by the Ministry of Public Works and then turned over to the municipalities. Consequently, The Ottoman Electricity Firm continued its operations until it was nationalized in 1938. Between 1938 and 1944 all foreign firms were nationalized whereas Kayseri power plant, which was built in 1926 as the first national plant, still carried the particular position. After the nationalization the generation and transmission were undertaken by municipalities and public sector. By the end of the nationalization period installed capacity reached to 407.8 MW, electricity generation was 789.5 GWh and the annual consumption per capita was 32 kWh. On the other hand, 23% of the total population was provided electricity. After the year 1950 the new government aimed to place private entrepreneurships in the whole economy and as well as in the electricity market to be able to fulfil increasing electricity demand. Four new firms were allowed to be established between 1952 and 1956 and they were given regional government concession. From these firms, Cukurova Electric Joint Stock Company (JSC) was established in 1953 to generate electricity from Seyhan Dam and hydroelectric power plants, The Kepez and Antalya Electric (JSC) aimed to build to hydroelectric power plant in Kepez. These two power plants are still operating in the electricity market. The other two firms could not succeed and liquidated. The State Hydraulic Works (DSI) was established in 1953 to regulate the construction of dams aimed at producing electrical power. By the year 1960 installed capacity reached 1272.4 MW, whereas it was 407.8 MW in 1950. On the other hand, electricity generation was 789.5 GWh in 1950; 2815.6 GWh in 1960, and the annual consumption per capita was 33 kWh in 1950 and 86 kWh in 1960. At the end of 1960, 32% of total population was provided electricity. Years 1960-1980 is called planned economic period. Electricity market was under consideration in Turkey especially after the World War II within the five years development plans. The fundamental principle of planning was supplying electricity at the right time and place, continuously without any difficulty. So electricity market started to be dealt as an important component not only for industrialization but also for the social life it gained importance. In this framework, in 1963, the Ministry of Energy and Natural Resources (ETKB), in 1970 the Turkish Electricity Authority (TEK) established to operate additional thermal power plants. These new establishments were for centralizing electricity sector. All power plants were transferred to TEK with the new regulation. The total installed capacity in 1970 was 2.235 MW and raised 5.119 MW in 1980. Electricity generation in 1980 was 23.275 GWh, annual consumption per capita was 459 kWh, and 80% of total population provided electricity by the end of 1980. In Table 5, there are the changes after the planned period which started in 1960s to the years 2000. In the first two planed period the goal was to reach 7% of growth rate and use of electricity was expected to increase 13%. To be able to fulfil the electricity demand hydroelectric resources were aimed to be given priority and it was decided to use petroleum in the electricity generation. Besides hydroelectric power, operating nuclear power plant came to debate. One of the most important objectives was to establish a governmental authority to operate all generation, transmission and distribution steps. On the other hand, it was stated in the plan program that taxes on electricity was needed in order to reach effectiveness. In the plan period, targeted electricity demand materialized as 12% but establishment of TEK was postponed to the next plan period. In the third period (1973-1977) a 15 years master plan prepared in 1972 and the main intention was to have continuity and reliability in electricity generation and provide it to the final users cheaply. The intention of building power plants was still in agenda and in discussion. On the other hand, the first step of interconnection system was targeted to complete and increase in electricity consumption estimated as 13% annually. However, the increase in electricity generation was slow in the first two years of the plan, with the help of Keban Hydroelectric power plant the increase was 15% in last three years of the plan. After 1980 the new government, which was carrying liberalized politics put in practice some new rules to attract and facilitate private participants to energy market. In 1982, monopoly carried by TEK concerning building power plant abolished, market opened to private sector. New law gave the right to private companies to built power plant and generates electricity and sells it to TEK. This system is called Built Operate Transfer (BOT) where a private party would build and operate the plant for 15-20 years and then transfer it to state ownership at no cost to the state (BOT). Through this system, although an application was done to build a hydroelectric power plant in Kayseri, and the permission was given to hydroelectric, due to some financial problems the permission to build power plant was cancelled. In 1984, as addition to the previous law, transmission, and distribution opened to private companies totally to be benefited from private sectors financial and operational efficiency. In 1993 in an attempt to privatization, TEK was separated into Turkish Electricity and Transmission Company (TEAS) and the Turkish Electricity Distribution Company (TEDAS). In the planned periods between the years 1980-2000, statements on building power plants were found place in the plan targets in an unclear manner. The idea of ending energy crisis and providing electricity to every individual village by the end of plan period was another concrete aim in the plans. Supporting private sector and foreign investment participation in exploration and production processes, benefiting from their sources and efficiency was put into the plans. Privatization was on the agenda and new formation where public and private sectors act together came to discussion especially in the period between the years 1990-1994. Comparing with major European and OECD countries and taking the population into consideration, in Turkey electricity consumption is less than the other member countries. As it is also shown in Table 6, consumption per capita is far behind the OECD average and while the average is 8381 KWh for OECD countries, it is 2053 kWh in Turkey for the year 2006. Electricity is cheaper in households and more expensive in industry and the government is actively involved to electricity market and more than 50% is produced by governmental enterprises. The rate of hydroelectric is 17% in production in the world, whereas it is 30% in Turkey. The rate, if wind energy in the world is 1% and the annual growth rate is 30%, whereas it is 0.05% in Turkey in spite of the existent potential. Although Turkey does not have significant reserves natural gas is used for production with the rate of 40% (TUGIAD, 2003). On the other hand, according to report by TUGIAD (2003) electricity in Turkey is comparatively expensive; it is not enough for the fast industrialization, urbanization and increase in population. In the electricity market in Turkey there are two state owned companies (TEAS and TEDAS) and two concession companies (CEAS and KEPEZ). As mentioned before, all the assets were combined in and operated by state company (TEK) and in 1993 generation and transmission separated from distribution. In the current situation in the electricity market, three new companies derived from TEAS; Turkish Electric Transmission (TEIDAS), Turkish Electricity Generation (EUAS), and Turkish Electric Trading (TETAS). Other two concession companies are active in generation and transmission in regional level (TEAS). Installed capacity has grown quickly over the past two decades. This reflects ongoing economic growth and increases in electricity intensity, which still remains at a level substantially below the OECD average. Hydropower accounts for a large share of installed capacity in Turkey (41% in 2000) but a smaller share of output (24.7% in 2000). There were 128 plants in operation in 2000. Turkey has no nuclear capacity and, following the abandonment of earlier attempts, no current construction projects. TEAS and its affiliates operate 70% of thermal capacity in 2000. Private sector participation in the construction of infrastructure, including new power plants was first made possible through the Law 3096 in 1984 that allowed for the BOT model for generation, and the Transfer of Operating Rights (TOOR) in respect of generation and distribution. By 1996 only six small plants (5 hydro and 1 gas) had been constructed under this law. By 2000, 18 BOT power projects (12 hydro, 4 gas and 2 wind plants) were commissioned with an installed capacity of 1.99GW. Private participation in the generation has been relatively limited with a number of episodes of difficulty. Private generators, which either own their own plant or have operation rights of plant legally owned by TEAS, account for 11% of capacity, and auto-producers (industrial companies which self generate and sell surplus electricity) account for 11% in of capacity in 2000 (OECD, 2002). The transmission grid in Turkey was owned and operated by TEAS prior to the separation into the new transmission company (TEIAS). Load is concentrated with the major population centres in the west of the country while until recently generation capacity was relatively concentrated in the east, reflecting the emphasis on hydro generation that is concentrated in mountainous regions, particularly the south east. As a result there were some transmission constraints due to the large cross-country power flows, and transmission losses are slightly above international norms. New thermal generation in the west of the country and electricity imported from Bulgaria has shifted these constraints (OECD, 2002). TEDAS is the major distribution entity, with its operations split into 33 separate areas. Other smaller distribution companies operate concessions in the Kayseri region and the CEAS and KEPEZ companies, which have their roots in the pre-TEK era. A major problem in the distribution is losses of electricity. These cause significant financial weakness in TEDAS. Electricity losses totalled 19.4% of generation in 2000, which is a substantial increase from system losses of around 15% in the mid-1990s. This is extraordinarily high by OECD norms use and typically this averages around 10% in the OECD. There are several contributory causes to this problem: municipalities do not pay for street lighting, part of the problem is technical. Turkey is obviously less efficient in deregulating the market and developing the competition comparing with Finland and some other OECD countries. During several decades electricity market was under the direction of state-owned companies to serve national best interests until 1990s. As it is mentioned by Joskow (2003), developed and developing countries have different motivations when they attempted to regulate electricity market. In that respect, Finland aimed to improve the performance of the existing system while Turkey was trying to solve some problem in the sector such as price subsidies, low service quality, high network losses, poor service coverage, and lack of private sector participant. The experience from the past two decades has shown that achieving sustainable private participation and market-oriented electricity sector reforms are more complex than initially anticipated. Even in developed economies reforms encounter problems and exhibit intended consequences. Developing countries have had to reform technically and financially less efficient systems with less developed private sectors, weak economic and political institutions, and shortage of human resources and regulatory experience (Jamash, 2002). Consequently, as a represent of developing countries features Turkey has always been facing economic and political insufficiencies and since 1982 it has been attempting to open the market to private sector and the sector is still in transformation. Although monopoly was abolished in practice, a market based on competition could not establish and state-owned companies did not orientate themselves towards efficiency. On the other hand, the privatization attempts were based on BOT system, which included bureaucratic requirements, so it could not attract private sector (Kulali, 1997). In the paper the economic and political situation of the electricity market is displayed within the historical perspective both in Finland and Turkey. In the studied period electricity market had different ownerships of generation, transmission and distribution in every country from private attempt to foreign firms or state owned companies. Finland is highly energy demanding country due to structure of industry, high living standards, cold climate etc. The electricity market is designed in an original way and towards privatization and more competition. On the other hand, the electricity market, generation, consumption and import are facing rapid growth in the Turkish economy. State-owned companies are involved every step in the sector; and electricity prices are kept low by the government. This has led to a lack of available funds for investment in generation, transport and distribution. Although electrification started earlier in Finland than Turkey, by the beginning of the 20th century both countries were agricultural and indigenous power resources were limited. However, Finland was politically not independent and economically was behind of its neighbouring countries, technology played an important role and it received foreign investment and technology for the hydropower projects. Therefore, Finland transferred technology and it ended up production of technology which is a crucial factor for the electrification. In Turkey, on the contrary, during the Ottoman Empire the power sector was mainly dominant by the privileged foreign firms and during the nationalization period state took an active role in generation, transmission and distribution. There were some significant investments on the electricity market in Turkey by the foreign firms but because the generation of electricity was later than the European countries and technological modernization was a slow process in accelerating the economy and the take off period was later also in Turkey. After some private attempts for electric generation the Finnish government started to have control of power sector especially after the independence and it prohibited exploiting the natural resources by the foreign firms and state owned companies started to operate in the sector based on the best interests of the nation. Especially after the World War II although state hold the control over the power sector but still there were hydroelectric power plants of the private sector. During the nationalization period the situation in the electricity market was the same in Turkey and it remained the same during 1980s and when compared with European countries and Finland particularly the market was opened to the private sector later than the main countries in Europe. Finland’s electric power market got stronger by the Electricity Market Act and it is one of the well functioning and liberal power sectors among European countries. Although with the Act the energy market became more competitive and benefiting participation of the privately owned companies, the market was already opened to private firms. On the contrary in Turkey, even after the deregulation, the energy market still is under the liberalization process and there are some bureaucratic barriers. After the 1980s, trend towards privatization and deregulation effected Turkish electricity market and the market has been deregulating since 1984. Deficit in electricity market, national debt, and the need to increase efficiency were driving forces behind the deregulation but the market needs to be opened towards liberalization to be able to attract more private sector participants. Fortum (2004) Official website of Fortum. Available at http://fortum.fi. 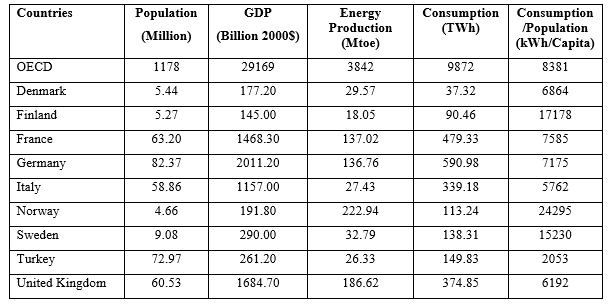 IEA (2008) Key World Energy Statistics 2008. Available at http://www.iea.org/textbase/nppdf/free/2008/key_stats_2008.pdf. International Energy Agency (1999) Energy Policies of IEA Countries, Finland Review. Available at http://www.iea.org/pubs/reviews/files/finland/. Joskow, P. L. (2003) Electricity Sector Restructuring and Competition: Lessons Learned. MIT, USA. Kaijser, A., Hedin, M. (1995) Nordic Energy Systems: Historical Perspectives and Current Issues. Science History Publications, USA. Kopsakangas-Savolainen, M. (2001) Restructuring of Electricity Industry-International Experiences. University of Oulu Working Paper, No. 17, Oulu. Kulali, I. (1997) Privatization in Electricity Sector and Turkish Case. State Planning Organization, Ankara. Maddison, A. (2009) Statistics on World Population, GDP and Per Capita GDP. 1-2006 AD, March 2009. Available at http://www.ggdc.net/maddison/. Ministry of Trade and Industry (1996) Finland and Energy. Helsinki. Myllyntaus, T. (1990a) The Development of Electricity Transmission in Finland. University of Jyvaskyla. Myllyntaus, T. (1990b) The Finnish Model of Technology Transfer. Economic Development and Cultural Change, Vol. 38, No. 3, Chicago. Myllyntaus, T. (1991) The Transfer of Electrical Technology to Finland, 1870-1930. Technology and Culture, Vol. 32, No.2, Chicago. Nevanlinna L., Lax G. E. (1969) Development of Hydropower. Waterpower in Finland, ed. by R. Salokangas, Tampere. Nordel (2009) Nordel Annual Report 2008. Available at http://www.nordel.org/. OECD (2002) Regulatory Reform in Electricity, Gas and Road Freight Transport. OECD Reviews of Regulatory Reform in Turkey, France. Pineau, P. O., Hamalainen R. P. (2000) A perspective on the Restructuring of the Finnish Electricity Market. Helsinki University of Technology, Helsinki. Ray, G. F. (1988) The Diffusion of Technology in Finland. ETLA Discussion Papers No. 258, Helsinki. Steiner, F. (2000) Regulation, Industry Structure and Performance in the Electricity supply Industry. OECD Working Papers, No. 238, Vol. VIII, Paris. TEAS (1997) Turkish Generation Transition Statistics. Turkish Electric Limited Company, 1997. TUGIAD (2003) Turkiye’nin Enerji Sorunlari ve Cozum Onerileri, Istanbul. Zenginobuz, U., Ogur, S. (2000) Turkiye’de Elektrik Sektorunde Yeniden Yapilanma, Ozellestirme ve Regulasyon, in Izak Atiyas, Devletin Duzenleyici Rolu, TESEV Publication Istanbul.